Home / Le blog / Wiki-Niort, what is this thing ? Wiki-Niort, what is this thing ? Wiki-Niort it's somewhat as if all the memory of Niortais was gathered in a single box, a box within reach of all the inhabitants. Do you remember some coffee O20100O (In the wine without water) ? Do you know that the brand Panzani is Niortaise ? Do you remember yourselves of Sainte-Pezenne in the 30s ? Do you know the musician niortais Josselin Arhiman or the caricaturist VIG ? Do you know why there are so many mutual insurance companies in Niort ? If "No" is your answer to one of these questions : go on the wiki-Niort website ! Wiki-Niort is a part of the big family of the existing wikis of territory with France. It is a web site the contents of which, created by Niortais, are dedicated to their city. The purpose being to draw a portrait of the city by Niortais, former Niortais, or quite different person having a link with Niort and its inhabitants. To make live the website and make it accessible to all, numerous animations are proposed to Niortais all year round and in all the city. "Wiki Zapéros" on varied themes ; initiations into the tool in middle schools, retirement homes, Community centers ; the organization of meetings for the groups of writers ; the participation in the major events in the city (TECIVERDI festival, Heritage Days, block parties) and also internships wiki ! 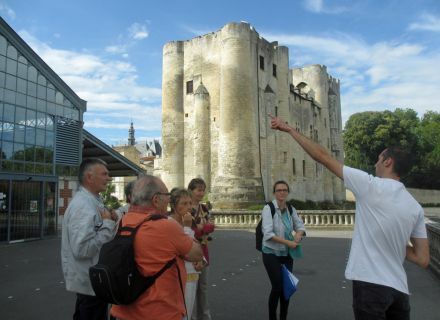 In partnership with the Tourist office Niort-Marais Poitevin – Vallée de la Sèvre Niortase and the Municipal Archives of Niort, wiki-Niort organized on Wednesday, July 2nd, 2014 an internship "Discovery of the city center!". 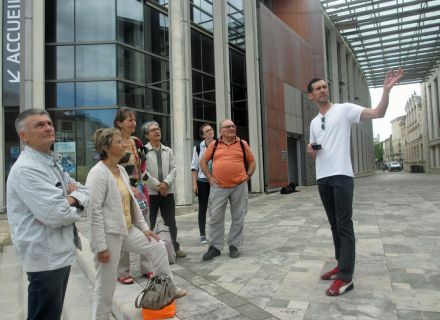 A guided tour of the places of heritage of the city center by Frédéric Soyez (the guide of the Tourist office), a discovery of the Municipal Archives with access to the storage places of the precious documents (the old plans of the city, the parchments of the XIIIth century, the old letters) and an initiation in search of documents on the scene of heritage discovered that very morning during the visit was proposed. Thus, a very busy day ! The participants left with a desire, that to return quickly to archives to discover the history of their district and share it with all Niortais on the web site. Wiki-Niort arouses now your curiosity, you wish to participate in Wiki-Niort ? Nothing more simple, create an account free of charge on the website and begin the adventure ! in Coulon Embarcadère "La Trigale"	At the heart of Coulon, offering thematic formulas, tourist train and restoration.